HTC's Desire brand has hung on through two revisions of the "company-wide" One moniker, oddly adopting features and style queues from the flagship series while aiming for a lower price point. So it is with the latest Desire phones to come to Verizon, the 526 and 626. Verizon announced the pair earlier today, with the cheaper Desire 526 going on sale tomorrow (August 13th) and the Desire 626 available "in the coming weeks." The 526 is the cheaper of the two phones, with a 4.7-inch 960x540 screen and an 8-megapixel camera (according to Verizon's short press release). HTC's website has rather more information, revealing a Snapdragon 210 processor, 1.5GB of RAM, 8GB of storage plus a MicroSD card slot, a rather diminutive 2000mAh battery, and a 2MP front-facing camera. The black-on-black styling and curvy body remind me of the original HTC One S, and the dual front-facing speakers are a nice addition at this price point. Software is Android 5.1 plus Sense 7, and the price will be $120 off-contract. Not bad. 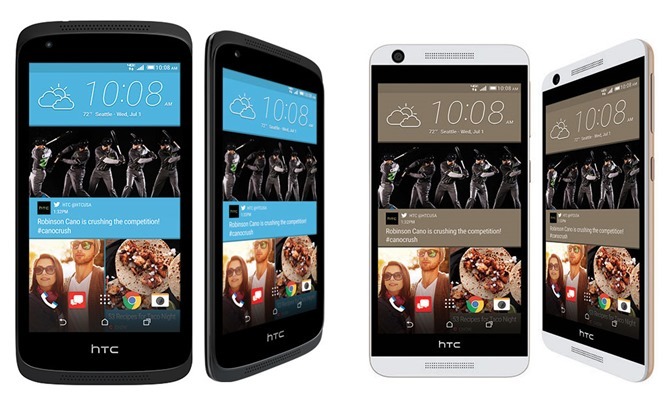 The Desire 626 adopts styling from the current One line. Colors in Verizon's images are only gold-on-white, though HTC makes the phone in several other variants. The 626 uses an identical Snapdragon 210 and 1.5GB RAM setup, but bumps the storage up to 16GB with an included MicroSD card slot. The screen is embiggened to 5 inches and sharpened to 720p, and while the rear camera is the same 8MP shooter, the front camera is swapped out for a 5MP "selfie cam." Battery is the same 2000mAh model, and the software is identical. Verizon hasn't announced a price for the 626, but given the specs, I'd expect it to compete at around the $180 range.